Leading sales intelligence vendor now offers full contact data integration with enterprise communication platform for improved SDR efficiencies. Partnering with a robust sales communication platform like Outreach, we aim to set SDRs up for success with high-quality contact data to improve response rates. DiscoverOrg, a leader in hand-verified sales intelligence, officially launched its integration today with Outreach, an enterprise communication platform for sales teams. Users of both solutions can now leverage the high quality and comprehensive contact data in DiscoverOrg’s platform and push selected contacts into customized sequences of interactions within Outreach. 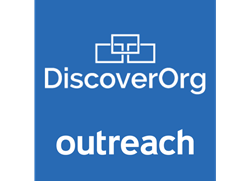 With the ability to filter by responsibility, installed technologies, location, upcoming projects and more, customers of both solutions can now build targeted contact lists and upload directly into custom Outreach sequences from within the DiscoverOrg platform. In Outreach, users can streamline and automate communication workflows with prospects, tracking all touch points throughout the cadence. This integration allows for more effective communication with prospects based on persona, combining both comprehensive, verified contact data and personalized, timely interactions. To see the integration in action, visit the announcement on Outreach's blog. For more information about DiscoverOrg’s related integrations, please visit the company’s SDR solutions page. Outreach is the industry’s most effective sales communication platform that empowers sales development reps, account executives, and success managers with the workflows to be more effective and efficient. Outreach provides communication workflows for calling, emailing, LinkedIn messages, and more, on top of Salesforce and their inboxes. Targeted to midsize and enterprise organizations, the platform helps sales teams engage their prospects more effectively with simple and scalable workflows. Outreach provides sales operations with a single platform that can be governed, measured, and kept in perfect sync with their Salesforce instance through the industry’s best bi-directional data sync on any object the organization needs. For more information, please visit http://www.outreach.io.